A crossword puzzle has been discovered in Smyrna, the ancient settlement where the modern Aegean city of İzmir was founded. 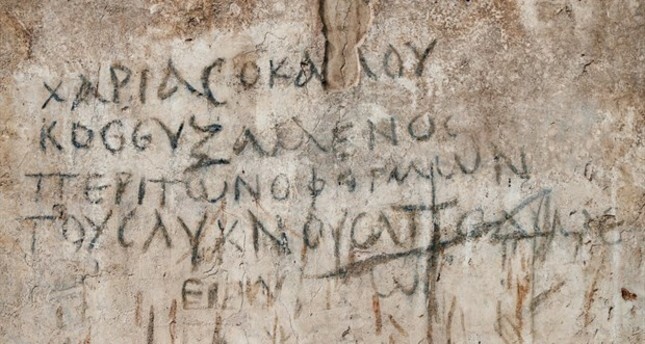 The crossword puzzle, located on the wall of the basilica in the market place of the ancient city, is composed of Greek words top to bottom and from left to right. Speaking to the press, the head of the Smyrna Agora excavations, Associate Professor Akın Ersoy, said the ancient city dates back 2,500 years. Ersoy noted that they discovered only one crossword on the wall of the basilica and continued: "It looks like an acrostic. The same words are written both from top to bottom and left to right in five columns. The word 'logos,' which is located in the center, is on the third column." Ersoy said it is hard to totally make sense of the crossword since there are also names of people featured in the crosswords. "There are scientists and historians who claim that the Christian community of the time was heavily pressured by the Roman authorities, and they invented these kinds of crosswords to communicate among themselves. However, we consider this as just a crossword because it's very out in the open. There should have been stalls in front of these walls since this was a market place. This finding gives us a clue about how the sellers of the time entertained themselves during their spare time in the market place." The agora (the market place) was the heart of one of the most important harbor cities in the ancient period. Archaeologists have discovered numerous descriptions about ships, the natural habitat of the city and gladiators on the walls. As Ersoy indicated, love poems written on the walls have also been unearthed during the excavations.